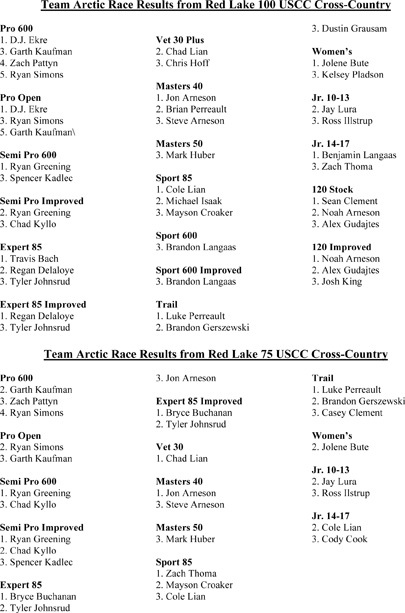 It was a beating of epic proportions at the World Championships of Hillclimbs in Jackson Hole, Wyo., as Team Arctic racers out-climbed the competition to score 10 victories by six different riders, including two podium sweeps. 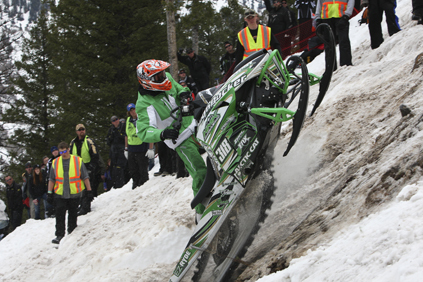 The star of the weekend was Kyle Tapio, whose record-breaking performance aboard the 2012 Arctic Cat ProClimb produced two class wins; both the Improved and Mod King titles; and the ultimate King of Kings crown. 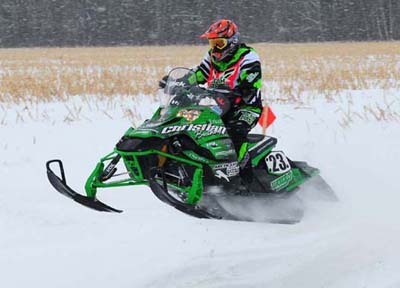 Facing the steep and wickedly-challenging Snow King mountain aboard Arctic Cat M sleds, Team Arctic racers notched victories in every category, from 600 to 800, and in Stock, Improved and Mod classes. Jeremy Archibald started the ball rolling by leading a podium sweep with Chance Buckallew and Ben Adams in the 600 Improved class. That was followed by another podium sweep in the 700 Improved final, this time by Rob Kincaid, David McClure and Archibald. Then Tony Zollinger claimed victory in the 700 Mod final. Having dominated the Women’s classes for several years, Team Arctic’s Amy Zollinger, Jan Ottobre and Christy Frisby once again put on a winning clinic at Jackson Hole, with Zollinger claiming the Stock class (where Frisby took third) and Ottobre winning Mod and taking second in Improved, all on M8 HCRs. In the big iron classes it was time for Kyle Tapio to reinforce his hillclimb legend status. Piloting his M8 HCR, Tapio won both 800 Improved and 800 Mod in convincing fashion. If Tapio felt any disappointment for taking third in the Open Mod final, he more than made up for it in the King competition, where the class winners in each category race for overall status. There, Tapio not only won the Improved and Mod King titles, he also scored the overall King of Kings crown as the best racer of the weekend. “Team Arctic racers and crews did an outstanding job at the World Championship, especially the incredible performance of Kyle Tapio, who was in a class by himself at Jackson,” said Arctic Cat Hillclimb Coordinator, Al Shimpa. “Ten victories by six different racers is a testament to the depth of our team and the strength of our M machines. 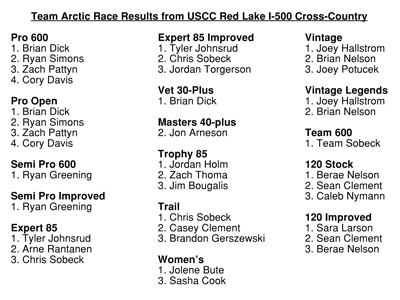 Team Arctic cross-country racers took advantage of a two-race USCC weekend in Red Lake, Minn., notching 20 class victories and 10 podium sweeps while inflicting twice the usual beating upon the competition. Jon Arneson, Bryce Buchanan and Luke Perreault also scored double-wins during the weekend, adding to their hefty hardware haul this season. 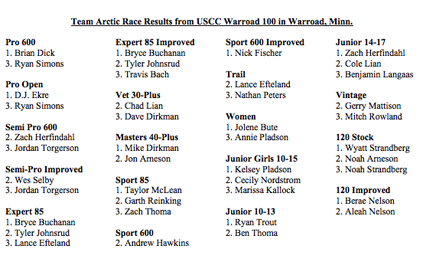 “Ekre has definitely found his sweet spot for speed these past couple weeks,” said Mike Kloety, Team Arctic Race Manager. “After bad luck plagued the start of his race season, he’s hungry for more wins while Ryan Simons is riding to maintain his lead in the championship points race. 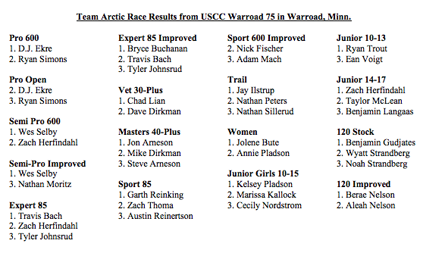 The next race in the USCC circuit is March 12 in Warroad, Minn. Go to USCC for more information. 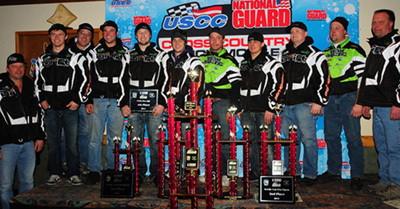 Team Arctic rolled into Fargo, ND, for the Dakota Magic Casino Snocross, hit the jackpot and rolled away with the lion’s share of hardware on the second stop of the ISOC National Tour. 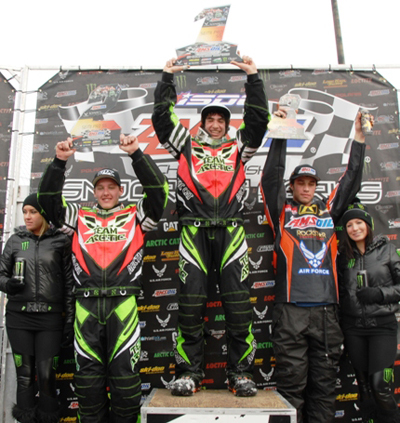 After taking eight of 12 class wins, including every Pro and Semi Pro final, Team Arctic racers and crew proved the only magic in Fargo was the classic Arctic Cat Black Magic. Tucker Hibbert continued his one man wrecking-ball approach to the Pro Class, with similar come-from-behind dramatics that brought Arctic Cat fans to their feet. 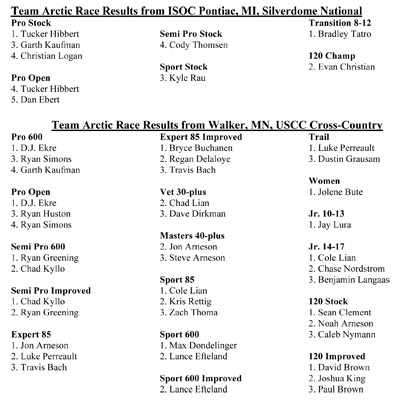 Racing his Arctic Cat/Monster Energy Sno Pro 600s, Hibbert led a cache of Team Arctic Pros that accounted for nine-of-15 finalists in Pro Stock, and seven-of-15 in Open. He’s now four-for-four on the season. Factory Team Arctic teammates Cody Thomsen and Kyle Pallin put on a clinic in the Semi Pro Stock classes at Fargo. In the first race, Thomsen started in the back row, chased down a fast-starting Pallin, got around him and took the highly-dramatic win. But Pallin would not be denied, and in the second Semi Pro final he again nailed the holeshot and simply checked-out, taking his first win of the season and Arctic’s third (of four) in this highly-competitive class. Carly Davis returned to the top-step of the podium in the Pro Am Women’s class, putting her Christian Bros. Racing Arctic Cat at the sharp end of the field for the first time this season. Proving the depth of the Team Arctic race program, Jesse Hendrickson won the Sport Stock final, while Travis Kern won the Junior 14-15 class. “Our riders had one of those amazing weekends, where we either won or finished on the podium in nearly every class,” said Mike Kloety, Team Arctic Race Manager. “Sure we love to see wins from top-class racers like Hibbert, Thomsen, Pallin and Davis, but it’s extra-satisfying when our Sport and Junior racers get some of the glory. Taking eight of 12 finals illustrates the strength of our Sno Pro 600, the talent of our racers and the dedication of their crews. 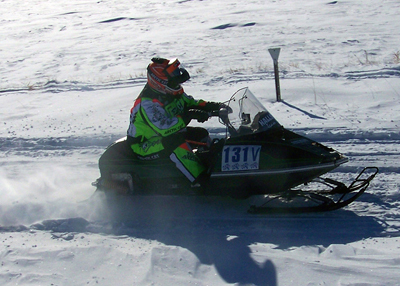 The next race in the ISOC National Tour is at Rio Tinto Stadium in Sandy, Utah, on Jan. 8. Go to www.isocracing for more information. Thief River Falls, Minn. (Nov. 29, 2010) – Team Arctic racers devoured the traditional Thanksgiving feast at the Spirit National Snocross in Duluth, Minn., claiming seven victories at the first stop on the ISOC National Tour, leaving only table scraps for the competition. Tucker Hibbert delivered what has become his signature performance, taking the win in both Pro Stock and Pro Open with a monster display of speed and determination. Shaking off mediocre starts in both finals, Hibbert’s come-from-behind heroics brought the crowd to their feet and the competition to their knees. Factory Team Arctic’s Cody Thomsen came within a couple laps of delivering his own sweep of the ultra-competitive Semi Pro class. He kicked off the weekend with a win in the Semi Pro X Games qualifier on Friday, took the first Semi Pro Stock final on Saturday, then came oh’-so-close to winning the Sunday Stock class final, finishing in second place. Joining Hibbert and Thomsen atop the podium were Team Arctic/Christian Bros. 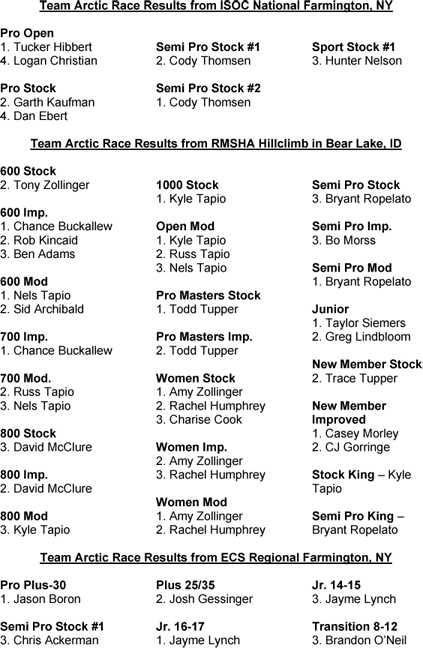 Racing teammates Logan Christian and Garth Kaufman – each winning a Pro X Games Qualifier final – as well as Bradley Tatro who won the Transition 8-12 class. 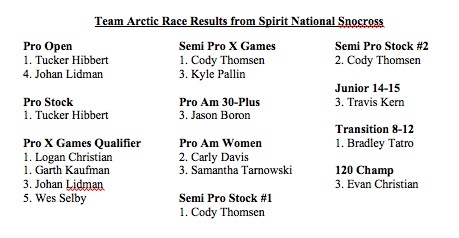 In his first race on North American soil, Swedish snocross sensation Johan Lidman proved he’s a podium contender in the Pro class, taking a fourth in the Pro Open and third in his X Games qualifier final for the Arctic Cat/Sportech team. 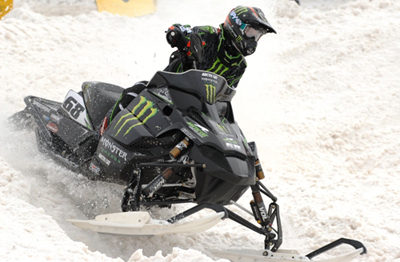 The next race in the ISOC National Snocross Series is Dec. 10-11 in Fargo, ND. 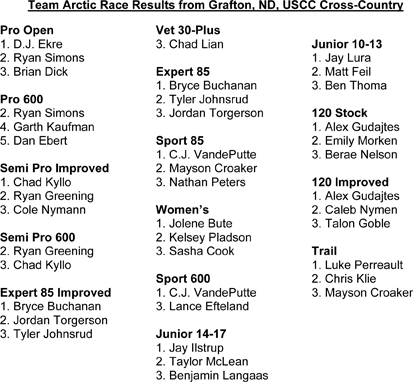 Go to http://www.isocracing for more information.